AEMO report confirms suspicions that the construction of proposed Snowy 2.0 pumped hydro project would result in more coal being burned for power needs, and will crowd out large scale solar and other storage projects. The Australian Energy Market Operator has confirmed suspicions that the construction of proposed Snowy 2.0 pumped hydro project would likely result in more coal being burned for electricity, and will crowd out large scale solar and other storage projects. Snowy 2.0 will be built – subject to final approval on its economics, engineering and environmental impact – by the federal government owned gen-tailer Snowy Hydro. A decision on the $6 billion and counting project is expected later this year. The proponents argue that Snowy 2.0 will be essential for a grid with a growing share of renewable energy, even though that appears to be the very outcome that the Coalition government is seeking to stop, or at least slow down. AEMO – in its inaugural Integrated System Plan, which it sees as its 20-year blueprint for the grid – says the grid is going to shift rapidly in any case to a share of at least 46 per cent renewables by 2030 (thanks to state based policies in Victoria and Queensland), and up to 61 per cent if a higher emissions target is legislated. This graph above illustrates the modelled impact – with Snowy crowding out more than 500MW of solar and Tasmania’s “battery of the nation” project doing the same thing in the 2030s, although it would encourage more wind. It is the short term outlook that is significant, and likely more predictable. AEMO’s modelling is based on the assumption that coal generators continue until the end of the technical life – 50 years – although it makes clear there is no guarantee there will be an economic case for them to do so. Indeed, analysts such as Bloomberg New Energy Finance and ITK’s David Leitch say the introduction of more wind and solar over the next 10 years will worsen the financial outlook for coal generators because demand will be hollowed out, and coal generators are not flexible enough to deal with it. That’s where Snowy 2.0 could help out – effectively using coal power to pump water uphill, before it is allowed to fall back down again and generate power for use when needed. That will improve the use, and the business case, of the existing coal generators, helping them reach their 50-year technical targets. It will be some time before there is enough wind and solar to generate the excess power that Snowy 2.0 could use to pump the water up hill. “The demand for baseload generation in daylight hours is predicted to decline significantly,” it notes. That’s because of the rise of solar – both “behind the meter”, which means on the rooftop of houses and businesses, and at utility-scale. These two graphs – above and below – show the evolution by category across the NEM. The one above is probably where we are at about now, with a predominantly coal-based grid with gas doing the response to changes in demand and some solar and wind capacity. This below is where we are heading – with significant amounts of rooftop solar (yellow) adding to the huge bulk of large scale wind and solar (red), particularly during the day. The green is charging for storage, using excess capacity. This, as AEMO chief executive Audrey Zibelman notes, requires a change of thinking about the management of the grid. As she says in this week’s Energy Insiders podcast, Australia finds itself at the leading edge of this, not least because of its growing share of renewables, but also because it is an island. The important piece of information there is a 1:! installation of solar with storage back-up. That 1:1 ratio is unlikely to be needed until the share of renewables goes well beyond 50 per cent. This is a necessary compromise to get the Integrated System Plan and Snowy 2, through the right wing of the LNP. But if renewable costs decline further and coal prices increase, reality could be quite different. The CSIRO report linked in the ISP shows solar prices in 2030 of $38 to $60/MWh, and wind of $50 to 60/MWh. Both these are below the fuel cost of coal-fired power in NSW for any coal purchased at the current spot coal price. If renewable costs decline more rapidly than these forecasts, coal will be under revenue pressure during solar hours, through both roof-top and large-scale solar. Snowy 2 will provide a supply buffer as Vales Point, Eraring and Bayswater enter their unreliable geriatric years, while also providing a floor price for solar. Meanwhile Riverlink between NSW and SA allows another 800 MW of large-scale solar in the Riverina, while also maintaining prices for SA wind power at times of high wind and low demand by accessing a non-correlated market. Why everyone is working to shoot down solar at every opportunity. I still remember Ergon’s outrage over: people are exporting to the grid to make a profit. I disagree that Snowyfart 2.0 is going to be good for coal. – Rates recover to the point where the arbitrage becomes worthwhile. Snowy is now selling electricity into the market at high rates and competing with the same coal generators that require these high rates to make a profit. The competition from Snowy during periods of high rates makes those high rates lower than they would otherwise have been and displaces 2GW of supply that would otherwise have been supplied by coal fired plants at a high cost. Having a competitor purchase your product when you’re selling it at lower than the full cost of production and then undercutting your price & volume by selling your product when the market recovers damages your business, it doesn’t benefit it. Snowy is a disaster for coal. the existing pumping process for coal stopped. It stopped because of market reality. We thought it would be full on every day. It was used every day before the market so we thought it would go harder. Pumping coal will be really low on the agender for Snowy. Snowy is a peaker with 13% capacity factor. It will very rarely empower coal to reduce peak price opportunities. Having said all of this it is important to note that the rule changes coming in the future will empower pumping. But it will be alligned with modern load shifting concepts. Base load plant will not win the bidding contest in the new market after a decade. Not really. They rely on the gas peakers’ gaming the market for sky-high prices in times of high demand and the ‘merit order effect’ to turn a profit. Arbitrage by storage sources (charged from whatever cheap generating sources are available during off peak, mainly renewables, but also cheap offpeak existing coal) will undercut the gas peakers and hence undercut every player (including coal) who would otherwise benefit from the merit-order-effect. No-one in power (political or electrical) cares about consumers. But consumers can rest easy that nature and progress does. Interesting point Steve. I guess we’d have to model actual numbers for each half hour of dispatch to get certainty around your concept though? Are you suggesting Turnbull Government could be doing something positive for renewables even when every gesturer his MPs make seems designed to destroy confidence in the industry? You’d definitely need the modelling to prove it. I looked at it from an accountants point of view, having worked in capital intensive businesses, and what a rational operator would need to do to get the project to work economically. I think the Turnbull government used Snowy because it has always been politically popular and they needed a big, flashy and popular announcable to help them with their political troubles. Any impact on existing generation, renewal or otherwise, is inconsequential as the Turnbull government will be long gone before Snowy 2.0 generat s it’s first MW. I agree about timing of announcement. Mr Agile Innovation himself had just been left on the sidelines as a deal with Tesla took place over twitter. He had to comet with a mine is bigger moment to allow his head not to explode I would imagine. Turncoat is on the record as far back as 2010 launch of BZE Report ion Sydney Town Hall as saying that storage is the “holy grail” of the RE transition. Maybe he said affordable storage. Either way he had many months as PM to advance this thought bubble into a feasibility study and that never happened, he just pulled this old idea of SnowyHydro’s out of the desk, dusted it off, and ignored their previous advise that it was uneconomic. Small scale PHES could make a difference in SA in the next few years. There’s a ocean water PHES 225 MW I think being supported by ARENA I believe. Definitely. Cultana (seawater scheme) is probably on the expensive side as well. But there are numerous other options which should come in much lower cost. SA should have been a priority after the blackout! As the further decline in cost to build wind and large scale solar year on year as i see it the output from both can be taken up by Snowy 2. As to how the majority energy producer fits in after there is a large build out of RE is hard to see. In the short term yes Snowy 2 will give a market to Coal Generators at low demand periods over night. Once RE becomes the dominant producer of power and that is quiet a long time away, then as I see it RE production during the day or night will be absorbed by Snowy 2 and used to fill the morning and evening peak. Mind it depends on the distance from Snowy 2 that RE is as to how efficient this will be. Perhaps PHES adjacent to large Solar and large Wind would be more efficient when there is sufficient Wind and Solar built a long way away from Snowy 2. Snowy does give the coal generators a market overnight when they are usually selling their output at below the full cost of production. Snowy then uses that electricity to compete with them during periods of high prices. All in all its bad for the coal business. Well yes correct as i said over night the generators will have a market to keep their system working and make a slight profit all good. However as more RE comes into the system and it is cheaper to produce this presents a problem for the incumbents. Mind we are a fair distance from this situation as Coal is the dominant producer of power overall. Yes in SA and TAS not the case. Sometimes I wish the people of NSW keep supporting the LNP and their blunders to experience the pollution and cost blow out and price increases first hand, in order to never vote for these clowns again. Max, I live in BereJOKElian Land ( NSW ) and I want her gone next year. Of the three circus masters O’Farrell / Baird / Berejiklian they have gotten worse and worse. I can’t imagine another 4 year term under the reign of ‘Our Glad’. The blunders, pollution and cost blowout would only become the ‘new normal’. The line in the sand is here and now. Agree… and I should be nice to my fellow Australians. I wonder how much more warnings do we need to awaken to what these eco terrorists are doing. Oh shut up, your doing fine. Not sure what set me off there but probably “eco terrorists”. I’ve said before I admire MaxG and anyone else who is self sustainable with no carbon footprint but it’s not practical to expect the other 99% of us to go off grid. All good, and I see you have had second thoughts. I’m vehemently opposed to this if it means that there’s more coal and less renewables in the system. But can somebody explain to me how other PHES is used to encourage solar and wind generation, and this crimps it? Are the other systems technology neutral, and this one directed? Or is it the other way round, with this directed at coal? Could Snowy 2 be ‘fixed’ if it was directed by law towards storage of low and zero carbon energy? Snowy 2 will buy power at the lowest price to pump water up to storage. If that is Coal over night then they will buy it. Over time as more Wind comes into the market overnight it will displace Coal. During the day if more Large Scale Solar is built it will displace Coal. Eventually Wind, Solar and Solar with Storage will replace Coal and this is helped by PHES be it large systems like Snowy 2 or smaller PHES systems yet to be built. Peter maybe. But maybe S2 is also a brilliant stroke by the Snowy CEO to get the expanded transmission capacity future profitability of the Snowy relies on? After all, the ISP seems to suggest he has succeeded! Being able to sell 4GW into Victoria or NSW at the drop of a hat is no doubt worth all he has spent on the FS. And once that transmission is in place, the numerous other potential PHES schemes will become more prospective! Great to see everyone waking up to the fact that Snow 2.0 is being punished on this website simply because it’s a liberal ideal. There is zero to back this up (this article they reference DOES NOT support their conclusion) and it makes no sense. In the short term it will mean less CO2 as Coal plants will run at optimal levels or be shut off because they are not needed. Snowy will be able to pick and choose when to enter the market and when to leave meaning the shoulders (the two peaks) will be where they are at full work. This will drive down the price. There will be no time when coal will be able to demand high prices. They will be running on a knifes edge! Only the most efficient Coal plants will ever turn on and we will slowly see more and more turn off as more renewables supply energy. Snowy 2.0 and the Tasmanian Hydro Battery will be amazing for CO2 reduction in the short term and High renewable penetration in the long term. Please remember the target ISN’T solar and wind it’s constant reductions in CO2. Renewables are the long term solution but while we need these coal plants let’s decrease their CO2 to kWh ratio. This is a great way to do this! Just remember it was not a Liberal Idea. This was was the original plan for the Snowy Development. So now people see through the bs that it’s an idea to support coal now it was a labor idea in the first place…. lol. not one current politician was involved in getting the snowy going. there has been many labor governments since. political spin to normal people is just bs. grow up support the idea and the people implementing it, be serious about solving the problem not on who solves it! you make the assumption that this loss won’t be consumed by the efficiency of running coal plants at peak efficiency, an assumption you can’t make. also curtailment which in some countries is becoming quite large would be mitigated. Chris I think you are assuming that the S2 funding could not be put to better use in multiple smaller pumped hydros. S2 and smaller plants will both be confined by the same morning and evening peak markets in their revenue, but S2 will have an enormous capital cost to find a return on, plus higher losses. Its smaller competitors will have the same opportunities to find low cost supply to pump, and so will outbid it. The only way that won’t happen is if the Feds come up with a way of specially rewarding S2 ability to cover long calm periods or the outage of a large thermal plant, and in that they would be competing with OCGTs. If S2 can’t sell its full storage capacity, then its LRMC, which is what it will have to earn on average to cover the funding costs, should be calculated on the basis of the storage they are on average likely to use. And on that basis it won’t compete even with gas peakers. Mike, you might be right but Snowy will be able to choose whether to charge or discharge as the storage level is so much bigger. Snowy will be all about reliability of the grid. It will allow Coal plants to stay on for days rather than hours above their need and when the grid is dominated by Wind and solar will allow an addition 2GW to be generated than the grid needs at anytime. Even if that last for 5 weeks. It will always have a great use, being owned by the government will mean it does have to be commercial unlike the other projects and funding costs are dramatically lower than commercial rates too. This will be an important part of our energy mix, whether you like it or not. It will also be able to replace normal Hydro when they are running low on water as this can happen in low rain times or when the grid has relied too much on them. 6 Billion on Snowy Hydro 2.0 is much better spent than 3 billion on a new coal plant! My logic is that when AEMO or others run their models, using S2 as a prototypical PHES messes up their figures and changes outcomes and planning directions. It’s a bit like ElectraNet using Cultana as prototypical in SA. If you want to justify lots of transmission, using expensive storage does the trick. Personally S2 would be incredible – I did studies on it around 1980, so it’s also good to greet the ghosts of the past. But in terms of the current transition I have to look at how we get to the destination as quickly, smoothly and as cheaply as possible. Early and abrupt retirements of coal is a real possibility. It will be damaging to pricing and to communities. So setting up a model that assumes coal will run on when there are strong forces that will produce very different outcomes is very risky. Snowy will do very well in contracting with windfarms (as it is in the market to do now) to “stretch” their conventional hydro. It will be able to firm wind up in the most profitable manner, as Hydro Tas will, which to me is a great outcome. I don’t see that additional long term PHES adds to that, but I do see that 2 things that do a) better transmission from Snowy to Melbourne and b) Snowy doing several large MW shorter duration PHES. For example, a modest pair of saddle dams and a main dam in the area near Nurenmerenmong connected to Talbingo gives 12h x 4GW with 3.5km long tunnels – that would really put some chilli in the soup! Sure – it means negotiating with NSW Forestry and may have other challenges unknown till you investigate, but is that insurmountable by comparison? Great point. If you look at everything as storage and only Wind and solar as supply it it make sense to first use the existing Hyrdo for the initial decreases in demand but we are actually getting close to that in many places. We have massive amounts of solar coming on in the next few years. QLD is going crazy. Existing hydro at full capacity is not enough to look after the grid on rainy days or days with little wind. We need a storage that can be build without rain that can keep months of storage currently this is the only proposal which does that. Something needs to be in place for the 1% of time. Wow. This is the worst article I have ever read on Renew Economy. 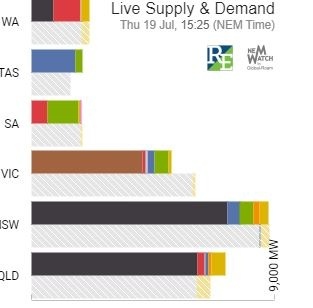 It is nonsensical to claim that Snowy 2 (or any other storage system) will buy power from coal generators when we all know that daytime solar prices are going to be very, very low as soon as all this new capacity currently in the pipeline kicks in. Solar and wind generators always win auctions because their cost of fuel is zero. The only time we will ever see coal recharging batteries or pumped hydro is late at night when there is no wind and nothing else to do with the output of the ancient old coal plants that can’t shut down and restart to satisfy demand. If you are going to burn the coal anyway (which is what they have to do because coal generators cannot shut down and restart quickly or economically), they you might as well do something useful with the power. Tony you forgetting that Solar and Wind is not the dominate generator yes they are both cheaper but not dominate atm. Yes they will be once the systems are built but not atm. And Snowy 2 will not be ready to buy ANY form of power to pump water uphill for several years yet. So let’s have this discussion again when Snowy 2 is just about ready to go into business. Thanks for the compliment. So, we are quoting AEMO here, but it makes sense. Yep, more solar and wind at daytime will push prices down, and that’s when snowy 2.09 may well charge its batteries, so to speak. That will increase demand, and lift prices, and make it less stressful for the coal generators running at the time. And given that until 2030 more than half the generation comes from coal, then that is what on average they will be pumping. I disagree that Snowy 2.0 will increase prices. It’s unlikely that Snowy will ever be in a position where they have no choice over the timing of their pumping activities, and as the electricity price can very accurately be predicted, they’ll time their pumping (demand) to capitalise on very low electricity prices – ensuring that they *don’t* materially impact on the wholesale electricity price. Their ability to arbitrage is going to make life more stressful for coal generators, not less. One correction Bud. Arbitrage is going to make life more stressful for NEW coal generators. If they ever eventuate, which they won’t. Snowy 2 as you know, will have available hundreds of Gwhs of energy without pumping. This will enable market cherry picking by the Traders and enough to cover those one off heat waves and low wind/solar cold snaps. Then pumping in circumstances rather rare and very low reward for the coal gens. I expect that coal will be rarely pumped in NSW and Vic. This will change if some coal gens are forced out sooner as there will be higher market cost for pumping. But all the while wind and solar will be first and last to pump because of the market. From all the figures I have seen Snowy 2 will be very efficient turning one GwH of cheap reliable coal fired electricity into half a GwH of even cheaper stored hydro power. This seems to be the Answer to Australia’s power problems, with hundreds of sites all over Australia having the perfect geological formation to build dams and their coal fired pumping stations right next to them. A definite win win for climate change and cheap power for Australian consumers. I think one of the most deciding factors on whether Snowy 2.0 will use coal power for pumping is the loss factor of the pumping operation and therefore the required price spread needed for arbitrage. There was an excellent article here on that a while back, mentioning -IIRC- a required minimum spread of 40$/ MWh between pumping (buying) and discharging (selling) price. Maybe this could be the theme of another analysis of Snowy here? Without the pricing information and the impact the new installation will have on the market, it is really difficult to forecast. Most influential will also be the completion date – I see it more mid- 2020s to second half of the 2020s – and the change in the generation landscape up to that point in time. Apart from all that the unique selling point of Snowy 2.0 is the simply huge storage capacity – good for prolonged generation in times of unfavourable weather conditions or large generator faults. One last thought: Snowy Hydro being government owned, construction of the 2.0 scheme might make the construction of new coal by a government entity less likely. Why? The easiest way for any new coal plant to be pushed by the Feds would be via an existing government entity already active in the market. Managing both Snowy 2.0 and a new coaler at the same time would at least be difficult if not impossible, both from a planning and construction supervision as well as a financial point- too much all at once. I think you are all wrong with the advances in battery storage as we are seeing all over Australia where batteries are now the main back up for wind and solar the federal government will commission large scale battery storage to supply the power for Snowy 2.o. It makes sense to use the most efficient source of power to pump the water up hill when the load is low late at night and the price of coal fired generation is half that of wind generation. Notice the major producer is Coal. Yes this will change but not over night. John that is because coal and gas are 68% of the capacity so one would expect that it generates most of the power. Old cheap coal power is one of the watchdogs guarding against new expensive coal power being built. New coal power prices would be about double that of the already-depreciated, government-built-then-sold-for-a-song existing coal power stations. Snowy 2 by offering a snifter to the old coal burners until they retire, is just one of the many reasons why no new coal power station will ever be built in Australia, i.e. one of the many reason why the NEG is such a crock! Lucky Snowy is government owned. Snowy 2.0 is probably just one of a number of government interventions which will be needed during the transition to keep the lights on and power bills down. The reason snowy 2.0 is so important is because it’s not just renewable that will be intermittent during the transition it will be our aging coal plants. It is better that the old coal plants are just left running rather than trying to ramp them up and down all the time to suit intermittent renewables which is very difficult to manage, the excess can go into the Snowy. That will be more cost effective and ensure a smooth transition. The Hornsdale power reserve is rumoured to have cost $100 m so we could buy 60 of those. i.e 6 GW vs 2 GW for this project. They could be reconfigured have 250 x 15 MW/4 hr units located in substations all around the country, still more peak power probably about 2,000 GWh less system losses around the country, far better resilience against storms, floods and fires and reduce generation investment by about $1 bn. Or we could just offer customers $200/kWh subsidy to put in grid controlled VPP batteries. $5 b government subsidy for batteries and $1b to network operators for integration and VPP. If customers put in an average 4 kW/10 kWh battery for a would provide 10 GW/ 25 GW hours of local storage and reduce transmission and generation investment even further. Such logic is anathema to the Coalition. Labor, however, is likely to adopt those ideas happily. Why not email Bill Shorten? For the information of readers, that is the format of the email for all Membersof the House of Representatives. Expect an initial formulaic acknowledgement only, and a long, sometimes permanent delay before a standard reply which will not address any points you make. It’s a bit like praying. Totally futile. But still, you will have tried. Good idea. The opposition of course has limited resources to manage their office, and I know from personal contact that the senior spokespersons can receive hundreds of emails per day. If you prepare a well argued email, try following it up with a call to the office. It’s a nice idea and I’m sure if it was viable it would be on the table. It would be a tough gig for Tesla right now they’d have to build even more production capacity. Right now we can’t lose the coal generators until enough renewable and storage is constructed. And Snowy 2.0 is a way for the government to help manage the phase out of the coal generators in an orderly fashion and keep a lid on electricity prices. The building of more batteries(large/ virtual) and hydro batteries will also be required. Regardless of what the government says now for political purposes, the coal generators will mostly be gone in 15 years anyway, imo. Read above, if the economics stack up I’m sure they will be put in. In fact, it should be a requirement of all renewable projects to come with storage, or pay for third party storage. Essentially, that is what the NEG is about. Pumped Hydro is still the cheapest form of bulk storage by a wide margin and I don’t think skyrocketing power bills is an option anymore. Having said that, I think there should be a price on carbon(probably not going to happen now). And the power pricing and bidding system should value the unique capabilities of batteries more(this is happening but slowly). Which would help level the playing field. More importantly from the government and consumers point of view. We need the economics of old coal to be good enough to keep them going for long enough so we can transition in an orderly way. If old coal closes too soon, you can guarantee power prices will go up and we will end up with new coal plants and the population poisoned against renewables..Worst possible outcome. Eric I wish I shared your faith in rational thinking from this government. I have been preparing Capital expenditure proposals for 45 years and they are always biased to suit the whims of the executive. This government and this Prime Minister would probably be the least evidence based government in living memory with the NBN, F35, $90bn naval program and now Snowy II. Behind the meter batteries and a slightly strengthened link to Queensland as well as the proposed new gas plants will give NSW more than sufficient backup to replace Liddell but Vales Point as well. They could also transfer Jay’s redundant emergency gas turbines from SA to Queensland. I must have blocked Eric. But Peter! I have total faith in rational thinking by this Gov’t. Total faith that they will never exhibit any. Ever. Perhaps if you were to present (false) evidence that coal would save the planet, they would scream in horror and rush to support renewables. Look, this is just all hot air. The fact is that renewable plus storage is cheaper than new build fossil plant and it is getting cheaper at a rapid rate. No one is going to invest in fossil anymore going forward to any great degree. This is fact. The tricky thing is to work out how the main supports of our electricity grid can be retired without pushing up electricity costs and affecting reliability of supply. That is a very very difficult problem to solve. Particularly as it is a perfect situation for private enterprise to game the system. The threat of Snowy 2.0 alone is enough to get market participants thinking and tempering their activities and rethinking their investment strategies. The Tesla big battery too. The NEG is a good idea IMO because it places a market cost on reliable supply. We can’t transition unless we have that. Eric – I think you will find most on this blog would agree that RE+storage is cheaper and will continue to get cheaper than FF. But that doesn’t mean any storage is the best we can have or won’t exacerbate problems we have. The NEM is not uniform in terms of problems at all. SA is transmission and generation constrained, Vic has the greatest risk from abrupt retirement of FF, NSW has the luxury of the best connection to the Snowy so has rested on its laurels, Qld has a significant risk of oversupply with limited export capacity. It is better that each of these problems is addressed properly but separately. Single big centralised ideas are unlikely to efficiently solve the actual issues. A reverse auction for storage both short term and long term in SA immediately after the blackout would have been appropriate – that’s not what the Feds did. The NEG is deficient on both emissions (already met) and security (on their own admission unlikely to be triggered), so a big nothing. Meanwhile AEMO has at least focused on each region and put up regional solutions, and solutions very focused on better deals for consumers. Hornsdale is 129MWh. Snowy 2.0 is 350,000 MWh. That’s 2713x not 60x. That is absolutely true, and the question is how much power vs energy do we need. No-one really knows. For the next 10-15 years at least 4-8 hours storage for 6 GW will allow us to eliminate all coal on a low wind day winters day. Then gas hydro and residual wind and solar will carry us through any recently experienced low wind period. By then we will have a far better idea of how effective we have been with energy efficiency, thermal storage, demand response, behind the meter and at generator storage to determine whether we need 2 GW/350 GWh or we would be better off with a dozen smaller plants close to the load. My current guess, which will definitely be wrong is that we keep about half our gas plants which will be fuelled by a mix of renewable hydrogen, biogas and a residual amount of NG. The natural gas will account for between 0 and 5% of our annual generation. At that point we will be far better off spending our effort decarbonising the rest of the economy and investing in sustainable farming and forestry rather than spending 5-10 times as much per kg of CO2 chasing the last bit of NG out of the system. In the immediate term, Snowy hydro is too big too inefficient and has the wrong balance of power vs energy. Obviously burning coal to pump water up hill is nuts, but there’s no reason why Snowy 2.0 has to be used this way. This is a piece of infrastructure with a 100+ year lifetime. In a world with masses of surplus solar in the middle of the day, pumping water up hill on a gigawatt scale makes sense. Build pumped hydro, build solar, build batteries, build CSP with thermal storage, build everything! I vote for all-of-the-above solutions. After a long working life justifying capital investments, I know you do the highest return projects first, they create the money to do the harder projects. If you do vanity loss making projects first you never have the money to do the down to earth money makers. TBH, I’m less concerned about expense and more concerned that we do something, anything at all, that will support a transition to a low-carbon economy. 1.2M ice-storage systems are not on the table, Snowy 2.0 is. If that’s what is politically possible then lets do it. FWIW, I think smaller scale storage will happen anyway, and gigawatt scale storage will come in handy to keep industry running and maybe charge a few million EVs overnight. Put it this way, if someone gave us Snowy 2.0 for free tomorrow you wouldn’t say no. Having 350GWh on tap is not a bad thing. But we don’t need any new storage in NSW for quite a while, there is a little bit of curtailment in SA at the moment and that would easily be fixed in a much shorter time by any one of the proposed pumped hydro plants there or even the VPP. How long is “quite a while”? If solar continues to grow exponentially, we retire coal and gas, and we electrify transportation, we’re going to need a shitload of storage in 20 years time. Sooner than that, but there is time to build all the storage we need, as long as we get on with it. The combinationof Solar, wind, PHES and battery will make for 24/7 power, rock solid. Central cooling of water (by standard means) to 5°C and pumping around the city via 70km of pipes; water is returned in a closed circuit at 15°C. Mostly big commercial or government (offices, hospitals etc) users. I don’t know for sure but suspect it uses off-peak nuclear power. France is one of the few countries which use their nuclear power stations in load-following mode (a consequence of having such high percentage of grid being nuclear). Time is the biggest problem. And there can be no possible doubt that Solar and wind are the fastest to commission from a standing start as well as the least cost to build and to run. PHES, using power from both as production exceeds dmand, and a battery to snap into instant action while the hydro water is coming over the dam to get to the turbines, whenever it is needed,. All four working together, in nodes all over the place, wherever there is access to the grid. Geographic spread making the most of variations in the weather. And practically no operating costs. No risk of the whole complex failing suddenly, no possibility of a catastrophic accident, just the force of sun and wind, powering the nation. Ice storage, lol welcome to 1990. It’s really in my wheel house. Most of those plants are lying dormant and for good reason. Cold storage is happening and is a great way to conserve energy but they are going to be flipped to run during the day not the night because that’s when energy will be the cheapest…. you might need to understand the way the system is moving to make such certain comments. There are many things we can do to minimise loads but at the end of the day there will be loads and if the wind isn’t blowing during the night and it’s no ideal days we will struggle to charge the small dams, then what? Snowy 2.0 is a hedge on the renewable bet. It guarantees 5GW of renewables are an questionable to the reliability of the network. No one can question it. Small 6 hour dams they can. It does actually… it creates a great opportunity for a good delta t across a glycol chiller. creating actual ice ie state change is highly inefficient glycol has a lower freezing point (-50c) so we use it for low temps like fridge and freezer control. I can understand that view but from a more rational perspective there is a strong possibility Snowy II will not be built. The plant itself combined with the necessary transmission upgrades and low efficiency provides very expensive backup. The EIS is yet to be written and may prove very contentious. One can see the forthcoming court battles over this dragging out over 3-5 years and then another 5-7 years for construction so completion moves from 2025 to perhaps 2030 or later, even if no government in the next 5-10 years realises what a boondoggle it is. Because of the long tunnels the plant itself is below average efficiency and 2 way transmission losses mean round trip efficiency from the coal generator all the way to the Snowy and back to Sydney could be as low as 60%. Therefore even capital costs are ignored it will have to sell power at 1.66 times its buy price just to cover losses. Then the actual transmission costs are about 3-5% each way so to cover operating costs they have to sell for double the buy price every day. However in NSW peak prices only average about 12-15% above average so assuming there is a typical 30-40% swing, Snowy II can’t even cover its operating costs let alone get a return on $6 bn of capital which on 4 hours a day at full power 5 days per week works out at an additional $186/MWh. What about if you think of Snowy not as a Traditional Pumped hydro that works only during peak times and instead think about it providing base load and allowing more Coal plants to be turned off. Snowy is a risk mitigation system, able to provide the same services as 2 GW of Coal plants for a very long time. It could be a substantial baseload for quite some time before needing to go into charge mode. This could be the infrastructure which allows midday to produce more solar than all load required on the grid but still have reliability as this supply falls for the evening and into the night. This is not about replacing peaker plants but instead about replacing baseload for the time when the sun isn’t shining. The Pumped hydro plants with better efficiency might be able to deal better with quick bursts but no storage will be able to deal with the 16 hours of no sun shine like This Snowy 2.0 will. If we want to move to 100% renewables the Australia grid needs a few of these long term storage dams. There is no other option other than turning on Coal and Gas plants for short periods. If you need a Coal plant of for a 12 hours even if it were a peak performance that would be 50% efficient. as it takes some 10 hours to actually perform! Snowy will be the big guy backing up the little guys. It’s like saying we could just use solar and Battery back up. It’s a very short sighted approach with out long term storage. Chris I think you need to take a portfolio approach: lots of short duration PHES distributed around the NEM and with very low capex ($1-1.2M/MW) will displace the role SHL is currently providing – covering evening peaks. That means SHL conventional hydro becomes the main player when conditions are such those “peakers” run out of water. It will be strongly complementary to wind, which is why SHL is in the market chasing wind PPAs. Its 4GW of conventional hydro will be the only show in town to cover those periods, and using less water on evening peaks and using wind to meet its retail book wherever it can, means it will have plenty of water to cover those periods. It is essential that it can bid the full 4GW in both directions, since failure of lignite plants is just as likely as black coal in the Hunter (possibly more so), so the transmission upgrade south is critical, as pointed out in the ISP. I would like to see a DC link from the end of Basslink to the Williamsdale to provide an alternative Sydney to Melbourne route if climate change exacerbates the possibility of fire knocking out transmission thru the Snowys, and that could also pick up wind/solar on the Monaro, the Star of the South offshore windfarm and PHES on the escarpment but that is probably for longer term. A good deal of the “16 hours without sun” is covered by wind. The renewable triplets, solar, wind and PHES make a pretty good team, and should, I think, be kept together whenever possible. A three legged stool is very stable, but add a fourth leg, battery storage, and you have a rock solid but highly flexible combination. In such an environment, how can coal survive? Now one of the people who actually know what they are talking about will hit me with a reality check, but hey, isn’t that a dream worth working towards? As long as neither coal nor Snowy 2 (lovely name for a white elephant) survives, I’ll be happy. I’ll probably be long gone by then, but that doesn’t matter. I’ll be happy. Solar Reserve said around the time they signed PPA contract with SA Government for Aurora that if they built another nine Aurora sized plants in South Australia then the cost of the final tenth CST + TS plant would be a much lower price (LCoE) than Aurora because they’d have local supply chains all humming by then and there’s still room for lots of learnings curve potential in this rather new (but known of for decades) technology. Having studied the numbers for these I’m not sure I see any component where there is lots of room for savings: there’s simply a lot of moving parts that have to be aligned and stay aligned very accurately, there’s the normal Carnot efficiency limits for a subcrit plant, and there’s very high temperature elements subject to high temperature corrosion. Compared to PV it just doesn’t look very pretty. And we’ve not yet built a greenfield moderate head PHES to see what they really cost – all those with detailed costings so far have had a few wrinkles in them. Solar Reserve apparently taking a lot of learnings from Crescent Moon into this one. CST tower and heliostat technology is not mature, even if aspects of it like turbine design/Carnot cycle are. I would expect new and cheaper tracking technologies to emerge over time as more and more plants get built for starters. You can take all the lessons learned you like, but that won’t change the exotic nature of the collectors (molten salt inside, intense radiation on the outside) or the extreme accuracy of a large piece of glass focused on it. Single axis trackers have benefited from ganging panels together, something not possible on heliostats. Okay, you go ahead and short SR shares then. Meanwhile I’m inclined to believe. I recall a linkup BZE did with the director of Gemasolar in Spain (that smaller that was I think the first CST using licensed technology from USA after USA shut down their CST program) for our monthly public talk /discussion group and he explained how shifting the focusing software from one method to something using video cameras and image processing software had increased beam accuracy by a commercially significant amount. Innovation shaves away at the margins, invention disrupts at the core. Even if we don’t see major invention, innovation will go ahead as it has in IT and other tech sectors for decades. The only reality check I can think of are winter wind droughts. They throw a real curveball into the models and economic extrapolation you do if you are not careful to take them into account. The BZE 100% RE plan, the first of it’s kind in this country at least, covered for it with lots of Concentrated Thermal Solar + Thermal Storage (CST + TS) (40 or 60% of total build IIRC) and lots of new transmission. Supplying 4 days of power into the NEM or NEW with very low solar PV output and zero wind only a few times a year from storage requires a scale of storage that would increase total system LCoE considerably. That will be reflected in the final price tag on Snowy 2.0 if it ever gets built. Other ways to cover wind droughts would be to overbuild no just storage for a few outliers of many days no generation export but overbuild wind, solar and transmission also to cover for the last 10% of non-renewable generation above 90% RE penetration. Or convert CCGT and build new OCGT to use bio-gas derived from on-farm plantation (not native forest) sources because it’s easy to stockpile gas in caverns or existing pipelines and storage. My feeling is some kind of power-to-gas technology will emerge the winner as more countries exceed 50% RE and are spilling or curtailing large amounts of energy, i.e. energy going to waste at a low or negative price. Creates opportunities for storage that are low CAPEX higher OPEX than Snowy 2 and even off-river small scale PHES which seems to be the cheapest today. I’m not sure how far wind droughts extend on the NEM but on WA’s SWIS grid they extend across the entire geographic region of the SWIS footprint for days on end several times a year over the colder months (much less insolation being the main season difference). Two weeks on the SWIS might see 3 days of non-trivial wind and solar generation. I think this is not unheard of over the eastern states but perhaps someone can confirm who knows the data better than me. How Snowy 2 would cover a wind drought in the NEM to repay it’s enormous costs will be interesting. If Snowy Hydro had control of the wholesale price for four days they could set the price at the ceiling most days and earn big money I expect. (Or maybe they’d withhold supply from PHES and burn diesel 😉 ). Would that be enough to cover the build costs though? Either way it wouldn’t be good for wholesale customers, i.e. all of us one way or another would get slugged with Gas cabal type pricing events a few times a year at least. Perhaps some new rules would come into place to stop them, but then again given the AEMC’s attitude to consumers in the past maybe they would. Multiple PHES near close as possible to demand centres because it delivers synchronous power would be more cost effective I’m imagining. I have zero knowledge of SWIS, but here in northern NSW, and we have a good deal of RE installations here, around Glen Innes and further west, although June can be overcast and a a bit rainy, it is windy. The rest of the winter so low wind, but high sun. Day length increases rapidly from the minimum of 10 hours to the present 10.5, 11 by the middle of August. Frosty nights give way to clear sunny days. Over the past two weeks, for example, my fixed panels have been churning out between 24 and 29 kwh/day, that’s 5X the rated 5.3 kW. For panels on dual axis tracking, the output would be much higher. I think SE Qld has a similar pattern. Not much help to WA, but for the NEM area, invaluable. Right now, at 08:40, 23/7/18, output is 2400w, typical for time of day and year. Wind speed here only 6 km/h, but in hilly areas there will be anabatic and catabatic forces operating because of the sun. My point being that in this big country, climate variations are very great. With a well connected network, the smoothing effects of that are very valuable. I agree Chris, I think of Snowy 2 as an insurance policy for the transition to renewables. It will be integrated into the market to pay its way, but its main purpose will be to utilise and back up wind and solar. A number of smaller schemes might be more efficient, but whether these will actually get built is not certain, and the more delays there are the more likely that outcomes will be settled on that constrain renewables. I’d rather have a certainty than a promise, given recent history. I’ve just looked at Hetties reply , and while I agree with her on most of her points, unless we see evidence of multitudes of PHES schemes being planned, we’d be better off getting behind Snowy 2 . If it gets the go ahead its got the finance and will be built. Investors just need a coherent stable market environment in order to get these and others rolling. Most are quite attractive prospects. what is the MWh numbers though? Not relevant Chris, for the reasons given elsewhere, tho’ most are 6-12h. I’m not sure you have checked out how seldom 157h of storage is needed, especially when it is, and in the future will be more so, available from the current storages. Wind and competing short term (6h) PHES will enable SHL to preserve that long term storage to when it is most valuable.